Note that I kept the original names from the toast template catalog, because sufficiently descriptive names would have been too long. I included XML documentation comments on each class to make it easier to choose the correct template. The code is available on GitHub, along with a demo app. A NuGet package is also available. A point of interest is how I created the template classes: I could have done it manually, but it would have been quite tedious. So instead I extracted the toast templates to an XML file, I added some extra information (property names, description for XML doc comments) in the XML, and created a T4 template to generate the classes automatically from the XML file. Today I ran into a strange problem that made me waste an hour or two, so I thought I’d write about it in case someone else faces the same issue. History suggestions are search queries previously entered by the user. This is handled automatically, so you don’t need to write any code for it to work. 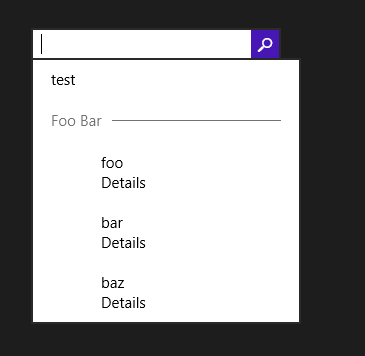 Search suggestions allow you to provide search terms based on user input; if the user selects one, the current query text will be replaced with the text of the suggestion, and submitting the query will start the search. Result suggestions are suggestions for exact results. The user can select one of these results directly without actually starting a full search. To provide suggestions, you need to handle the SuggestionsRequested event of the SearchBox, and add suggestions using the AppendQuerySuggestion and AppendResultSuggestion methods. Let’s focus on result suggestions. This code runs without any error, and the suggestions are displayed… but the image is not shown! I spent a long time double-checking everything, making lots of minor changes to try and locate the issue, I even wrote a custom implementation of IRandomAccessStreamReference… to no avail. (Note that the method is not asynchronous anymore, so there is no need to use the deferral object). So, the lesson of this story is that even though the image parameter is of type IRandomAccessStreamReference, it doesn’t seem to accept anything other than an instance of the RandomAccessStreamReference class. If you pass any other implementation of the interface, it just fails silently and the image is not shown. This is obviously a bug: if the parameter type in the method signature is an interface, it should accept any implementation of that interface, not just a specific implementation; if it doesn’t, it should be declared of the concrete type. I submitted the bug to Connect, hopefully it will be fixed in a future version. It’s often useful to be notified when the value of a dependency property changes; many controls expose events for that purpose, but it’s not always the case. For instance, recently I was trying to detect when the Content property of a ContentControl changed. 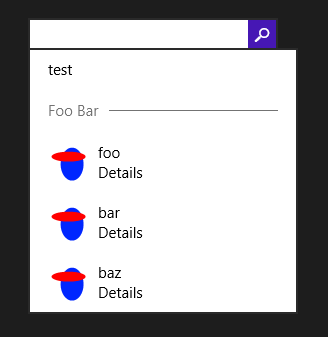 In WPF, I would have used the DependencyPropertyDescriptor class, but it’s not available in WinRT. I hope you will find this useful!